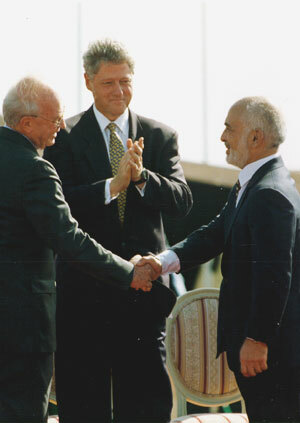 On the 10th anniversary of the Israeli-Jordanian peace accord, Israeli filmmaker Dov Gil-Har reveals the story behind the secret negotiations which lead to the historic treaty. Shalom Jordan unveils the covert talks between Jordan's King Hussein and Israeli leaders since the early 1960's and their culmination in the historic accord sealed in 1994 on the banks of the Jordan River. Exclusive interviews with three former heads of the Mossad, a Prime Minister, statesmen, negotiators, experts and journalists reconstruct for the first time the clandestine, fascinating and dramatic quest for peace. Former Israeli Prime Minister Shimon Peres laments how a careless slip of the tongue drove him out of the peace process; British Lord Victor Mishcon recalls the secret talks in his private London living room, and former head of the Mossad, Ephraim Halevi, explains how he became the King's most trusted man.